For the second post in a row, I'm going to steer away from herp related stuff to talk about fishing. It's well known among fishermen that lunar activity can cause surges in feeding activity of fish and sometimes it even brings out bigger fish. With the nearing full moon, I've gotten out and fished quite a bit this week and have managed to catch good numbers of both largemouth and smallmouth bass. 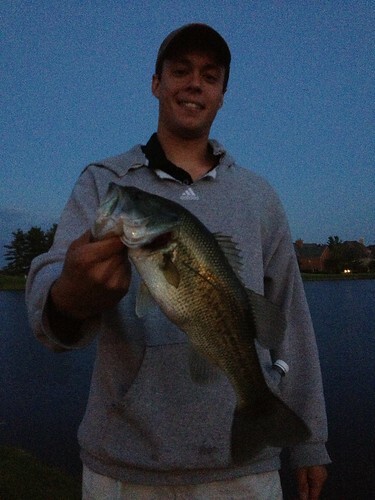 But on Wednesday night, Ryan Luke and I decided to go out under the full moon to do some bass fishing. 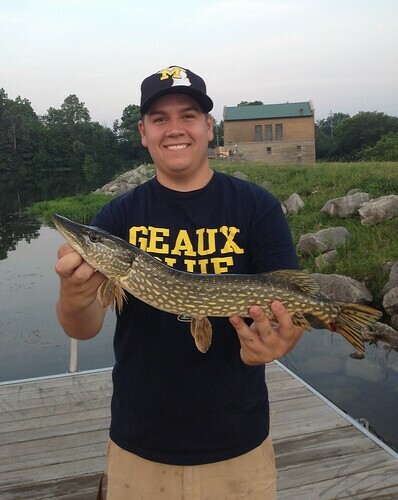 Ryan managed to catch a nice pike before I arrived just after 9 o'clock. We spent our first hour and a half of the night throwing a wide array of lures in hopes of landing a monster between the two of us. We threw topwater lures, crankbaits, and jerkbaits with no luck. Finally as the moon got higher in the night sky, we both decided to start throwing large, single bladed black spinnerbaits. 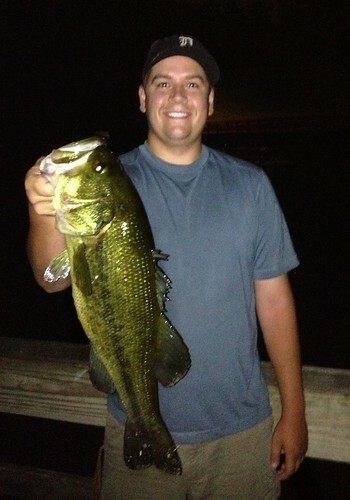 Fishing spinnerbaits with lots of vibration at night can be deadly for bass. 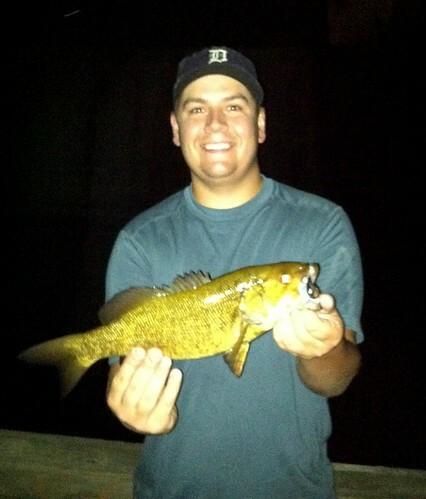 I managed to catch a nice little rock bass and this smallie, which was particularly fun in the current. I had another smallie on the line a short time later but lost it. At about 11:30 PM, I decided to move under a bridge in fairly deep water to try my luck. I pitched my spinnerbait up against the concrete support and let my spinnerbait sink a bit before slow rolling it across the bottom. Within a turn and a half of my reel, there was weight on the opposite end of the line. Upon setting the hook, line immediately began to fly off my reel. 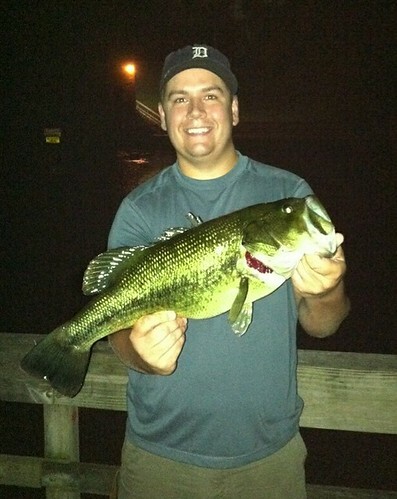 I've caught a few 3-4 pound bass this summer, but this was something different. I looked over to Ryan and said, "This is something big." The fish never jumped, but just continued to make runs and pull some drag. Given the clear water and cobblestone substrate, I figured that I had hooked into a big smallie, boy was I wrong. Eventually I was able to get the fish close enough to shore for Ryan to shine his light on it and when we saw what it was, I think we both may have crapped our pants. 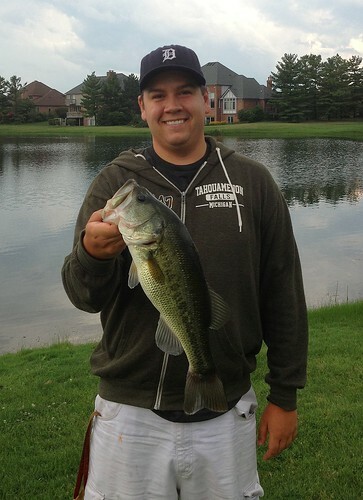 I've been dreaming about catching a bass like this since I was a kid. This monster measured in at 21" long and weighed right around 6 pounds. 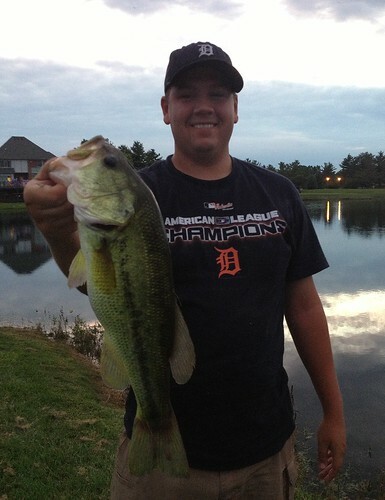 Bass like this in Michigan do not come around very often due to our northern latitude and short growing season. 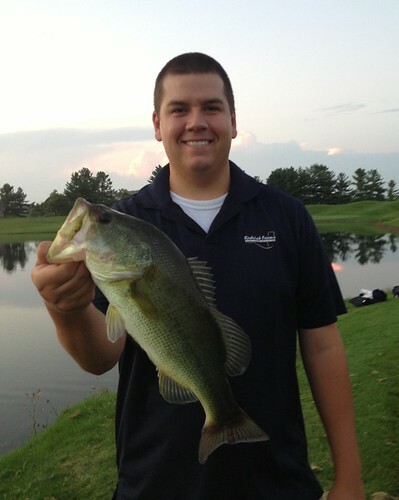 So for this part of the country, this is truly a trophy largemouth. We spent a few minutes taking some photos with this fish before letting her go. I've had several people ask me, why would you let such a trophy go? For me it's simple, I only keep fish if I'm going to eat them. 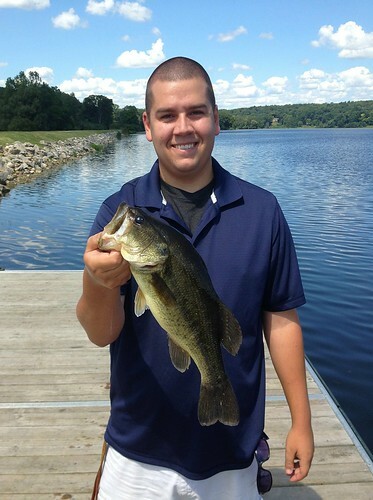 Largemouth bass around the keeper size of 14" tend to taste okay, but the larger they get the more muddy they taste. A fish of this size would not taste very good given the warm water temperature. Bass take many years in this part of the country to reach a size like this and simply killing one to put it on a wall seems like such a waste to me. Replica mounts look just as good and last longer, and the best part is that the trophy fish gets to live. This big girl may end up on my wall in the near future, but we'll see. I took one final parting shot before letting this monster go back to its haunts. I still can't describe the excitement of getting to land this thign and this may truly be a once in a lifetime kind of fish. I recently upgraded to a 6'6" medium heavy Ugly Stik which is a bit stouter than the shorter 5'10" medium action Ugly Stik I've been fishing for many years and it handled this fish really well. I had armed the rod with a Pflueger President 6900 series spinning reel and 15 pound Spiderwire Stealth braid. This teflon coated braid has a 6 lb. test monofilament diameter and handled extremely well. I couldn't have been more pleased with how this new outfit handled this big fish. All in all it was an awesome experience. A memory I will keep with me for the rest of my life. Though most of my time in the outdoors is spent looking for reptiles & amphibians to photograph, I also enjoy wetting the line. It was my dad who first took me fishing as a young kid. I remember spending long days in our boat catching a limit of panfish and then taking them home to filet up for dinner. But it was a pond down my street which really hooked me and some buddies I've had since childhood on fishing. 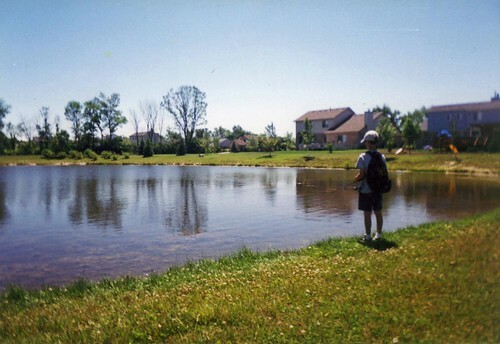 Most of our summer days were spent outside as kids and at some point, we began to notice older kids riding their bikes with fishing rods toward the pond down the street. 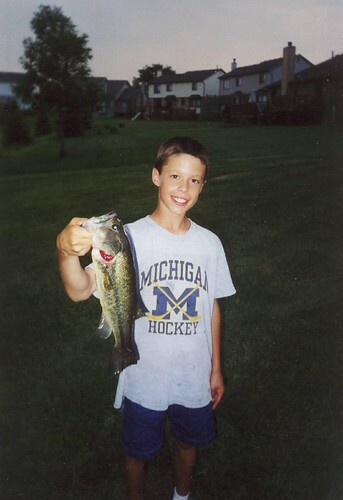 The first day we went fishing is one of my most vivid childhood memories. I was probably 10 years old or so and my good friend Ryan was probably 7 or 8. The water was very murky and there was a stiff breeze causing a choppy pond surface. I was using a small spincast outfit with a 2-3" pre-rigged plastic worm on four pound test line. After a few casts, I felt a stiff pull on the end of my line so I jerked my rod to set the hook. I still remember the sensation of the bass shaking its head and then flying out of the water with an acrobatic jump. I landed the fish which measured just over fourteen inches. 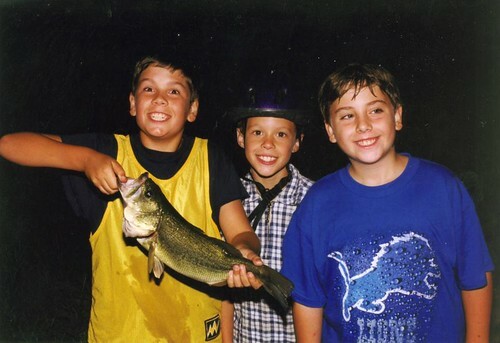 This was the moment when we all realized that the pond had largemouth bass in it, and we were all hooked. 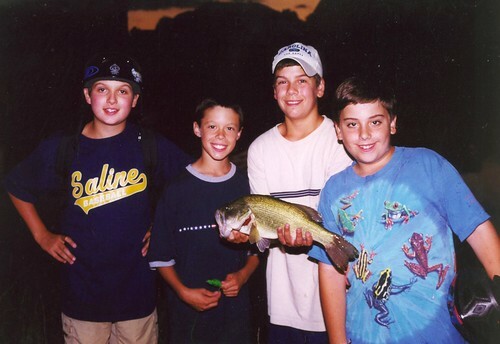 Ryan, Brian, Dylan and myself began to make more regular trips to the pond. Sometimes, other kids from out block would come in the evenings, sometimes in numbers of ten kids or more at a given time. The more we fished, the more we learned. And the more we learned, the bigger the fish got. 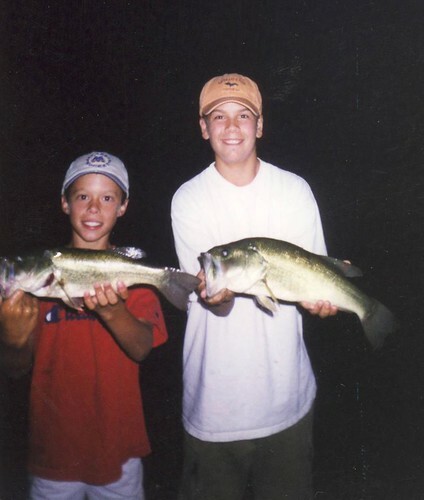 I used to buy disposable cameras to document the fish we caught at the pond and have managed to scan a few photos from our younger years fishing at the pond. Though we've been separated for long droughts at a time, all of us have managed to keep in contact with one another and stay close friends. And for the first time in many years, all of us boys are once again in our home town for the time being. What else would we do in our spare time this summer but fish? Unfortunately the pond we grew up loving had a major die off event a year or two ago, likely due to eutrophication. Small fish seem to be present in the pond, but I'll come back to that at the end of this post. Because of the loss of fish at the pond, we've spent most of our summer pond hopping around the area. 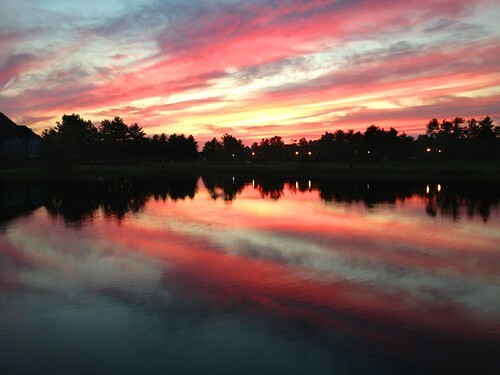 One of the first nights that we went fishing this summer brought Ryan and I to this beautiful spot. The water here is deep, clear, and loaded with aquatic vegetation, making it an ideal haunt for bass and northern pike. We only managed to catch a few decent pike on this evening, but it was enjoyable nonetheless. One pond has been particularly productive. Its deep, clear, and has lots of aquatic vegetation and baitfish. Early on in the summer, the topwater bite around sunset was particularly spectacular. We had many nights of landing twenty or more bass each at this pond, including some hawgs. Arbogast Jitterbugs, Heddon Zara Spooks, and various buzzbaits were particularly effective. 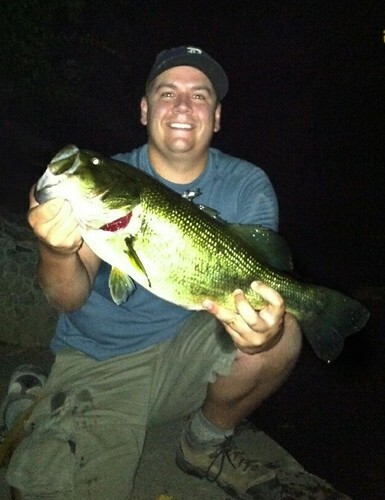 We've also had lots of success on a single bladed, black Strike King Night Spinnerbait. These spinnerbaits are large (9/16 oz) and make a lot of vibration, so a long, stout rod is a must. We've had the most success by slow rolling these large spinnerbaits in deep water just after dark. 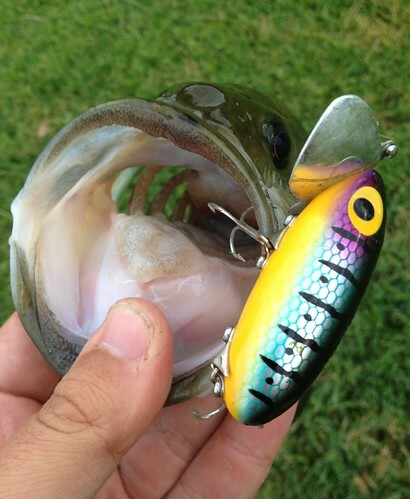 Another interesting side note regarding fishing this summer has been a lure company that I've long heard bass fishermen rave about, but have never tried myself. The manufacturer in question is Gary Yamamoto Custom Baits and their best selling soft plastic, the senko. 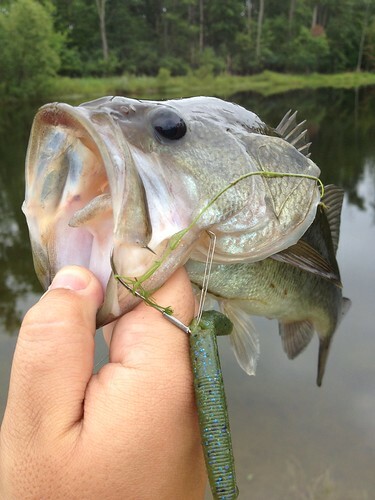 The senko is essentially a straight plastic worm that lacks a twisty tail or have much action at all. However, the bait does fall horizontally in the water with a slight wiggle that seems to get the attention of nearby bass. You can fish it weighted or unweighted and rig it however you want. I prefer to rig it wacky with a weedless hook and fish it really slow. The proof is in the pudding when it comes to this lure, and I've caught some of my biggest bass this summer on the Yamamoto senko. And finally to close, what's happened with the pond down the street? After the total collapse of the fish population there a few years ago, some fish have hung on and begun to make a comeback. The pond is loaded with lily pads and the water is murky, but there's still some decent fish there. We've caught some decent fish in the 14-15" range throughout the summer, but nothing to write home about. 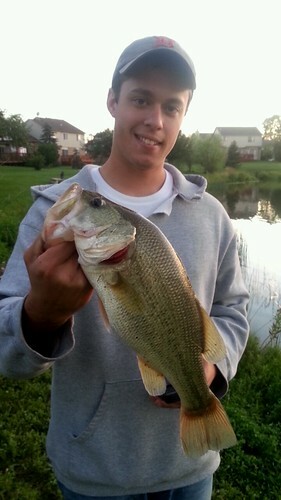 That was until one particular evening when Ryan caught this absolute pig on a Rebel Pop-R.
For us, its exciting to see that this place we spent so much of our summer months as kids fishing is making a comeback. I hope to take my own kids to this place some day so that they can enjoy the great fishing just down the street that I did. That's all for now. 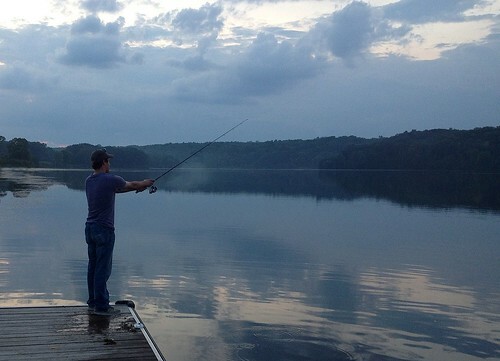 Until next time, remember, a bad day fishing beats a good day working! 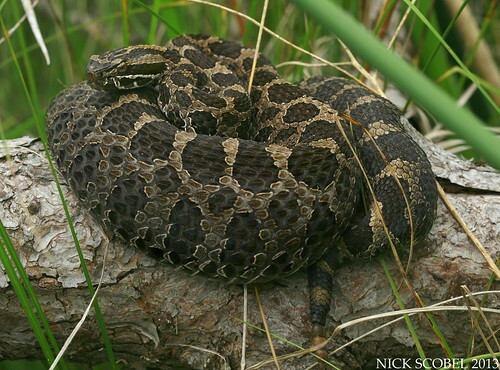 It's not a secret that Michigan's only species of venomous snake holds a special place in my heart. I've been fortunate enough to see massasaugas in many different places across Michigan and have been able to observe some interesting behavior. But since I saw my first one in the field, I've always wanted to observe one in the process of swallowing a meal. Massasaugas are shy, reclusive species which are difficult enough to simply encounter in the field, much less finding one eating a meal. Encountering such an intimate moment is a rare thing and requires an incredible amount of sheer luck. This past weekend, I was finally able to encounter such an event. I met the brothers Boguslawski at one of our favorite sites for a morning hike. While walking along one of the trails in the area, we noticed a Meadow Vole (Microtus pennsylvanicus) along the edge of the trail near some tall grass that appeared to be in bad shape. The vole was on its side, twitching occasionally. It dawned on us that perhaps the vole had been tagged by a massasauga, so we decided to leave the area and come back a bit later. 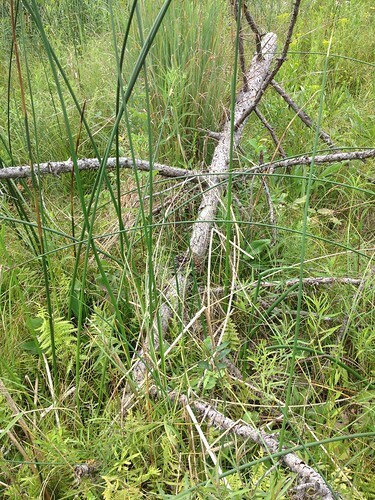 We moved to an open wetland which has been productive and spotted a large gravid female basking about two feet above ground level on a fallen tamarack. This big girl never moved a muscle and allowed me to take a few shots from a relatively close distance. You can see how heavy bodied she is, hopefully she'll be popping out some little tykes in the next few weeks. We moved out of the area and walked another small meadow but didn't see much of anything. We decided to walk back to the area where the vole was in hopes of seeing the rodent's killer in the flesh. As we came upon the area, I think we all were elated to see this sight. Certainly an awesome thing to see in the field, particularly with this species. 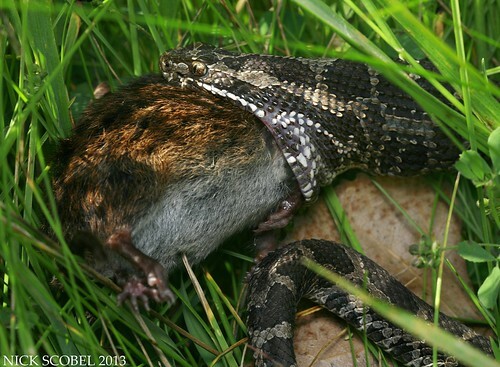 This was a young massasauga which was probably about twelve inches in length and as you can see, the vole was considerably large in comparison to the snakes head and body. Snakes have the ability to dislocate their jaws in order to swallow prey items several times the size of their own head. Such a large meal will probably tithe a snake of this size over for the rest of the year. Because they are ectothermic, snakes require less energy physiologically and only need to feed a few times a year. Shortly after firing the above the photo the snake retreated into the tall grass, dragging the vole with it to finish the job. Looking back on the encounter, it gave us all a greater insight into the life of this secretive snake species. Like all rattlesnakes, massasaugas are sit and wait predators which likely utilize scent trails left by rodents like meadow voles. 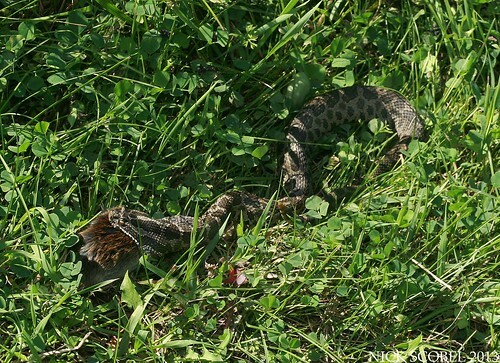 The snake had likely set up shop along a regular pathway used by the vole and waited for it to pass, delivering a fatal strike. The rodent probably stumbled a short distance to the edge of the trail, where it died. The snake used its tongue to follow the scent of the animal where it had fallen and began the process of swallowing its meal. This is the second time in my life that I've been lucky enough to observe a secretive species feeding on its prey in the field, the other being a mud snake eating a siren in southern Illinois. It was something that I'm sure I may never see again in my lifetime, I'm just glad I had my camera with me at the time.